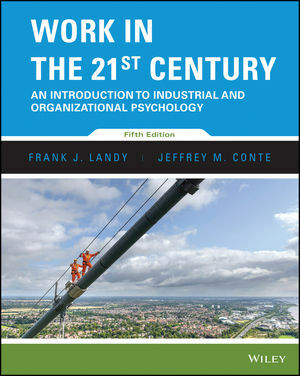 Work in the 21st Century, 5th Edition by Frank J. Landy and Jeffrey M. Conte, ties together themes such as diversity, mental and physical ability, personality, interpersonal skills, emotional intelligence, and evidence-based I-O psychology in a way that explores the rich and intriguing nature of the modern workplace. The 5th edition places an emphasis on the technological and multicultural dynamics of today's workplace. This edition retains the 14-chapter format and the 4-color design, which brings I-O psychology to life, especially with the use of newsworthy color photographs. Frank J. Landy is a consultant and researcher for the United States Department of Labor, Department of Justice, Department of State, Department of Defense, the Equal Employment Opportunity Commission, the U.S. Nuclear Regulatory Commission, and other agencies. Currently, as SHL Litigation Support Services CEO, Landy is working in the area of employment discrimination and human factors litigation. The Professional Practice Series is sponsored by The Society for Industrial and Organizational Psychology, Inc.. The series was launched in 1988 to provide industrial and organizational psychologists, organizational scientists and practitioners, human resources professionals, managers, executives, and those interested in organizational behavior and performance with volumes that are insightful, current, informative, and relevant to organizational practice. Presents new topics, including corporate social responsibility, big data, mobile assessment, work analysis, neuroscience in leadership, and positive work environments. Updates in every chapter, including new or expanded coverage of topics such as emotional intelligence, recommendation letters, adaptive performance, electronic performance monitoring, performance management systems, high performance work practices, social networking and the workplace, corporate universities, and the factors that influence innovation in teams. A wealth of new material has been added, and less current material has been removed. Modular approach: The text features self-contained sections within chapters, for maximum teaching flexibility. Each module ends with point summaries and key terms. Cutting-edge topics and research coverage: Includes the Five Factor Theory of Personality, emotional intelligence, culture and emotions, genetics and job satisfaction, achieving balance between work and non-work, stress and violence, bullying, measuring motivation, integrity testing, entrepreneurship, computer-based assessment, male vs. female leaders, cross cultural teams, and more. Emphasis on critical thinking: One of the goals of this book is to show how many of the broad principles of I-O psychology can be applied in situations at work. Thus, the text emphasizes critical thinking, and the Instructor’s Manual includes critical thinking questions that can be used inside or outside of class to help students to think about situations in the workplace and apply the principles and concepts they've learned. Case Studies and Boxes provide concrete, contemporary examples of the issues involved in work and behavior in various applied settings. Clear, articulate explanations: The clear prose and interesting examples make the book accessible to a wide range of students.